So I know that you’re all probably thinking…who is this wacky chick that suddenly just showed back up out of nowhere. As I’ve said before I’m finishing up my Bachelor’s degree and this is my last semester. This means that I really have to spend some time actually focusing on school work and not just nails nails nails all the time. I have been trying to keep up with posting my nail art on Instagram so if you want to just see what I’m wearing that week…go check it out! So to the polishes at hand. So when I made an order with Carpe Noctem last week the amazing maker included some samples for me to review. 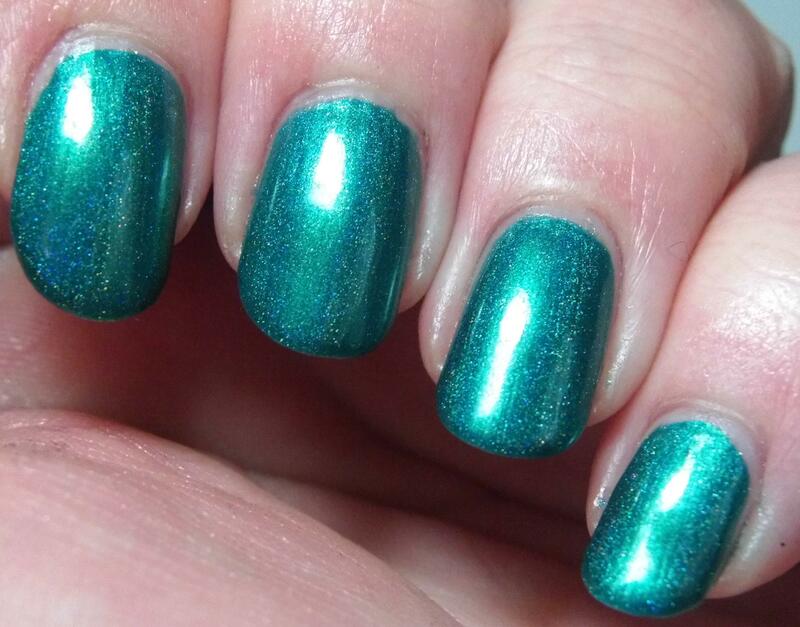 They are from her “Always Greener” collection and they are so perfect for St. Patrick’s Day of course! If you are following me on the aforementioned Instagram then you’ll get to see the St. Patty’s Day nail art that I do…I’m sure that you’ll be seeing some of these polishes again! Let’s get right into the review because I know you’re tired of me rambling on and on and just want to see pretty polish. Sorrynotsorry. I love this sweet soft mint green. This is a squishy, gorgeous, and creamy pastel mint green crelly but does it stop there? Oh no it does not! Then there is a dash of sparkly flakies and subtle holographic to top the whole thing off. This is one sweet polish alright! Oh yes just lovely. Now this one is a crelly so it has a sheer quality to it. When I was looking at my nails in person they were opaque so don’t let my photo throw you into thinking that there is very visible VNL – I’m pretty sure it’s my lighting setup. These photos show three thin coats plus topcoat. Application was perfection, no dragging or leveling issues. Polishes used: Glisten & Glow – Stuck on Blu; Carpe Noctem Cosmetics – Sweet Escapemint; Digital Nails – Ain’t Nobody Got Time for That Topcoat. 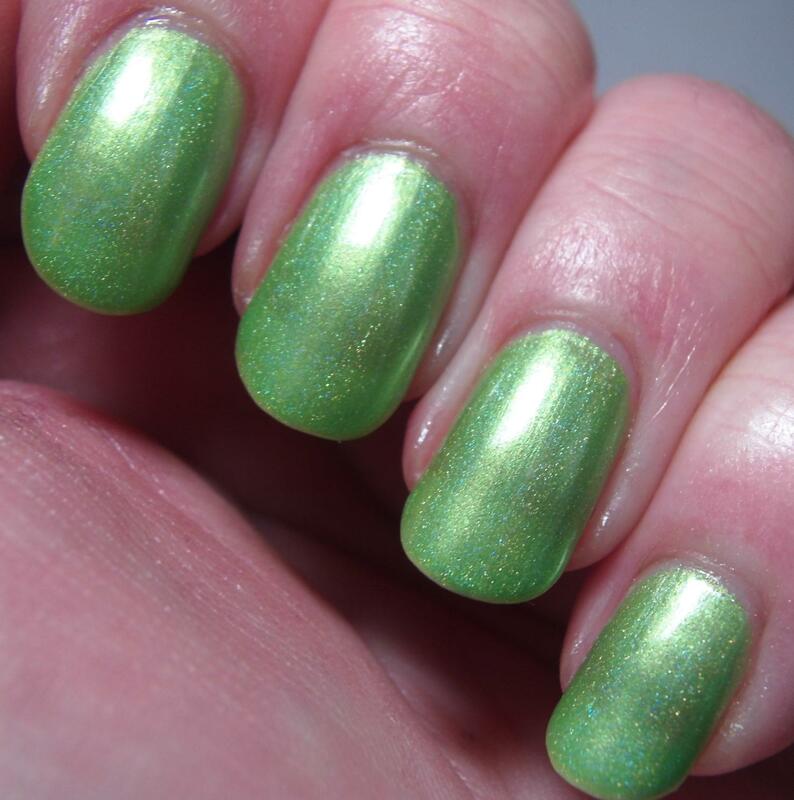 This is a perfect gorgeous lime holographic polish! This has a bit of a unique finish, it’s not really satin, it’s not frost, it’s not metallic. I guess I’ll describe it as a sort of frosty metallic lime green base with a very noticeable linear holographic effect. It’s really quite lovely because it has the classic beauty of a frost without the brush strokes and the fun modernity of a holographic polish. I really like it because it adds tons of dimension to a polish that could have ended up very one note. Just like Sweet Escapemint when viewed under average conditions I didn’t see any VNL. However the combination of lights and my super prominent nail line just did me in with these two! As with all holographic polishes you might have to move a little bit quick because I’ve noticed they tend to set/dry pretty quickly and that can cause some dragging if you’re not aware of the dry time. I don’t find it to be a huge problem because I’m pretty used to working with a wide variety of finishes on polish and I had none of those issues with this polish. Polishes used: Glisten & Glow – Stuck on Blu; Carpe Noctem Cosmetics – Losing Lime; Digital Nails – Ain’t Nobody Got Time for That Topcoat. Oh.My.Heck. This polish is STUNNING. Ya’ll know me, y a’ll know that I’m crazy about all things teal, blue, turquoise and otherwise ocean colored polishes. Seriously if I could dye my hair any color it would be mermaid colors and this exact shade would be one of that myriad of ocean colors that I would choose! This is a beautiful green leaning teal (more on the green than blue side of the spectrum) with a strong holographic effect. There also appears to be some kind of shimmer or shiftiness going on that again just adds dimension to the polish! Ya’ll just look…so amazing. I’m already planning on getting this in a full size and maybe a back-up because it is so so so much perfection. I used two coats for this picture but honestly I wore it earlier in the week in a nail art look and one coat was perfectly sufficient. Oh did I mention it also stamps beautifully! No issues at all with application and it was so shiny that unless you use topcoat for other reasons besides adding shine you could do without it. Polishes used: Glisten & Glow – Stuck on Blu; Carpe Noctem Cosmetics – Teal the Deal; Digital Nails – Ain’t Nobody Got Time for That Topcoat. Again talk about a gorgeous polish. Now, I’ll be the first to admit that I haven’t been the hugest proponent of holographic polishes in the past however now with the advent of all the latex (and non latex) masking fluids that have hit the market lately I want to do ALL. THE. GRADIENTS. Guess what holographic polishes are great for? GRADIENTS. 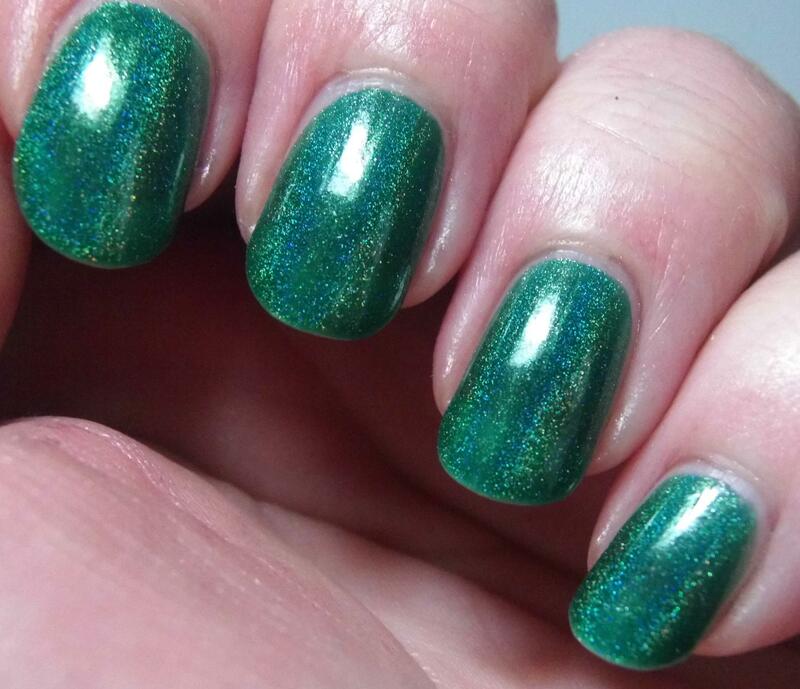 Anyway that’s all the hint you get about future St. Patty’s nail art looks kthxbai. Anyway, I’m off track again aren’t I…well next time poke me or something so I get back on track. [Insert Emerald Pun Here] is a beautiful dark emerald green jelly holographic polish and has a lovely strong holographic arc. Now then this one had no problems at all with application but it does dry pretty quick because it’s a jelly base and holographic. Because it is a jelly base the first coat is sheer but these photos show two coats plus topcoat! Gorgeous. Polishes used: Glisten & Glow – Stuck on Blu; Carpe Noctem Cosmetics – [Insert Emerald Pun Here]; Digital Nails – Ain’t Nobody Got Time for That Topcoat. Now I’m sure that you’re saying to yourself…”But Relly, how can I get my OWN Always Greener polishes??!! !” Never fear I’m going to help you with that. 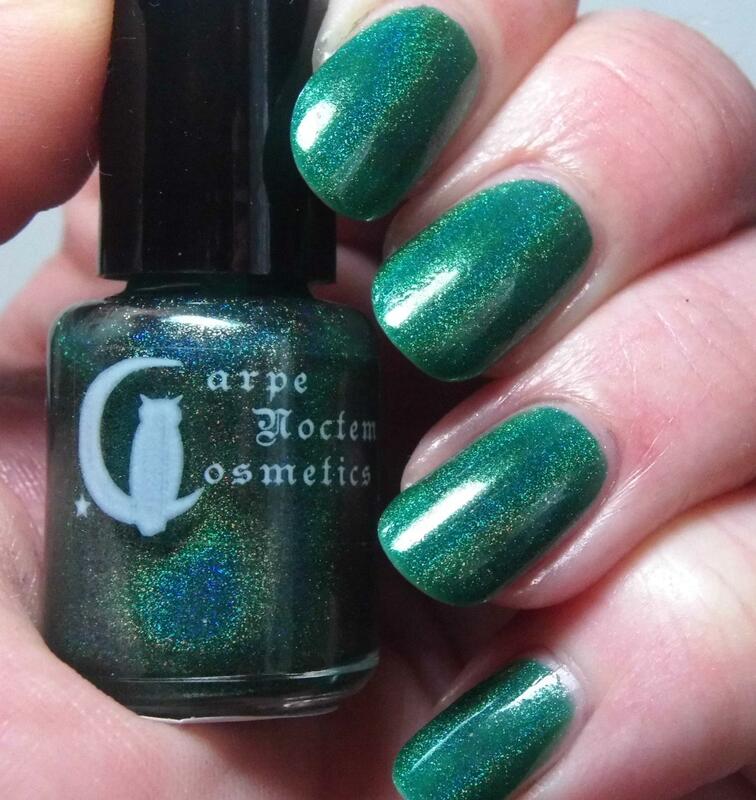 If you visit Carpe Noctem Cosmetics’ Etsy Shop you can purchase directly from her. 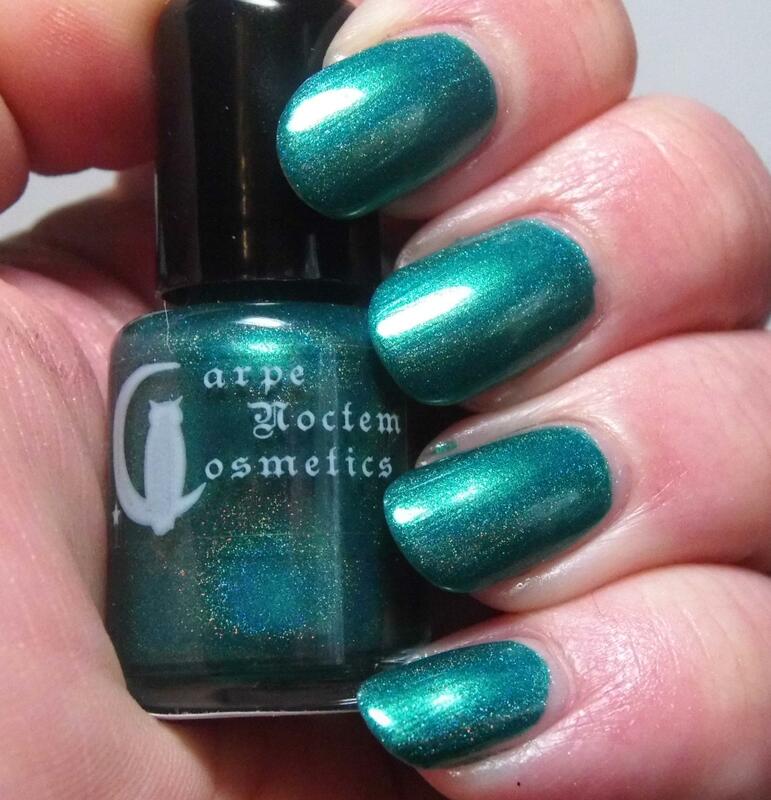 If you want to keep up on all the CNC news and see pretty polishes all the time then make sure that you follow Carpe Noctem Costmetics on Instagram and Facebook. 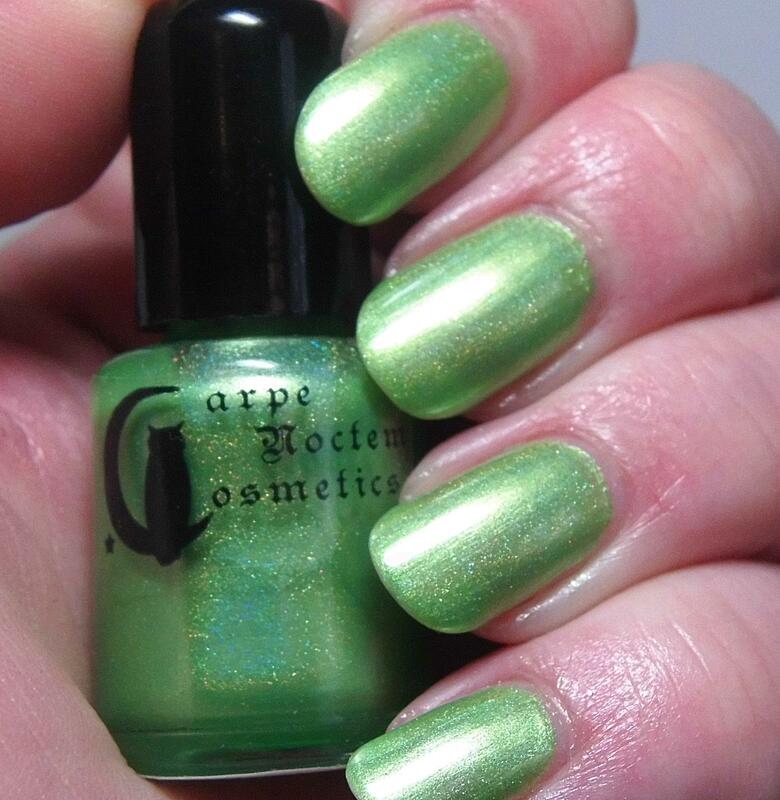 This entry was posted on March 1, 2015, in Carpe Noctem Cosmetics, Indie Polish, Seasonal. Dearest readers! I know that you thought I fell off of the planet, but alas, no I am here. I’ve just been exceptionally busy and I feel terrible about neglecting a midweek post! The first part of the semester is always hectic as I try to get into my routines and balance my work load. Isn’t she lovely? Did you totally just sing that phrase in your head? Just me huh…ok moving on! 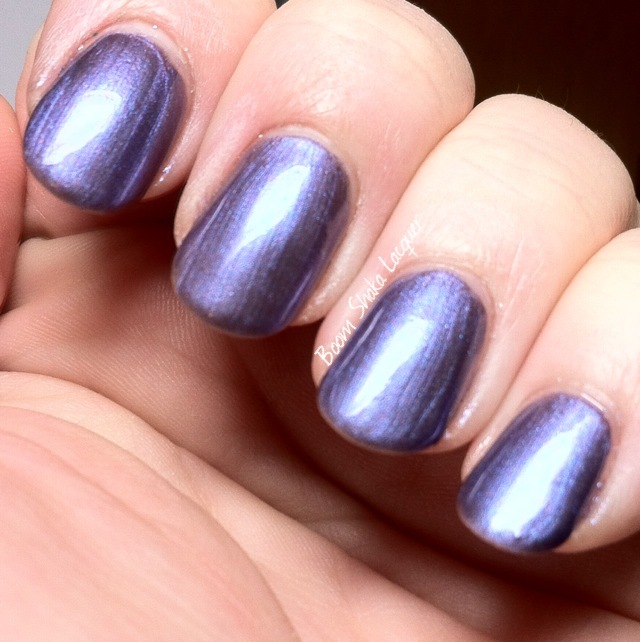 Sapphire Abyss is a lovely dusty purple shimmer polish with a PROMINENT blue flash. Seriously I kept just shifting my fingers under the lamp because I was mesmerized! I mean it’s just so pretty! 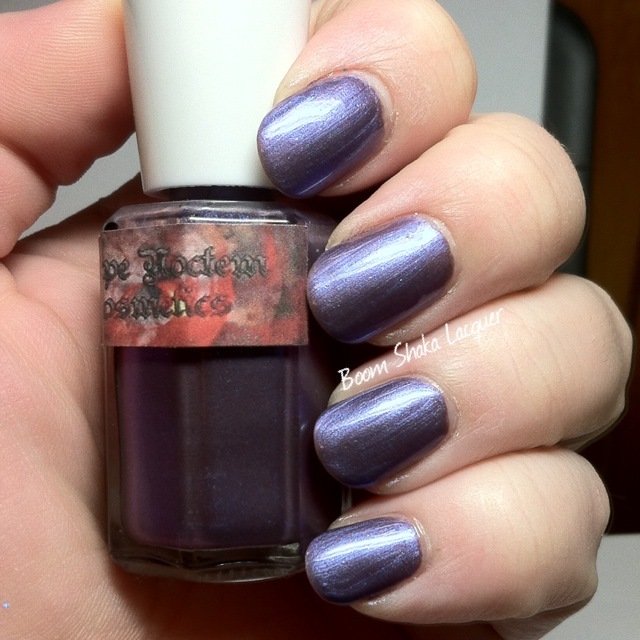 I need more polishes like this in my collection as I tend to gravitate to glitters…but glitters need undies! Nail art is something else I need good solids for and this one is a good solid. The formula is good! Nice even opacity in two coats without any dragging or balding. The only thing is that I noticed that you can sort of see brushstrokes so I was very careful with my second coat. Nothing that a little patience doesn’t take care of! Overall I’m really delighted with this polish! Polishes Used: Glisten & Glow – Stuck on Blu; Carpe Noctem Cosmetics – Sapphire Abyss; Glisten & Glow – HK Girl Top Coat. I promise not to take off again for so long without warning! Do you want your OWN bottle of Sapphire Abyss? I know where you can find it! Carpe Noctem is available in her Etsy Shoppe. If you want to keep up on all the news and happenings then definitely check out her Facebook Page!